When you're looking for an outdoor fireplace to enhance the outdoor space of your home, the Empire OLL60SP12SN Carol Rose Outdoor Stainless Steel See-Through Linear Fireplace can be your answer. With its stainless steel design, it adds the perfect amount of class and aesthetic appeal to your outdoor space. 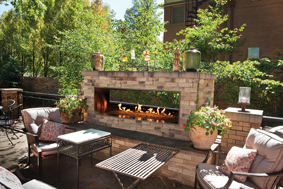 With a maximum output of 70,000 BTUs, this fireplace can heat a large area to make it comfortable and relaxing for any gathering with family or friends. Because it is see-through, not only will you feel the warmth of the fire, but you'll also be able to watch the crackling of the flames as well. Can a blower be added for this fireplace? Can we use other decorative media? A blower is not available for this unit. The decorative media approved for this unit can be found in the drop down menu on the unit's page.